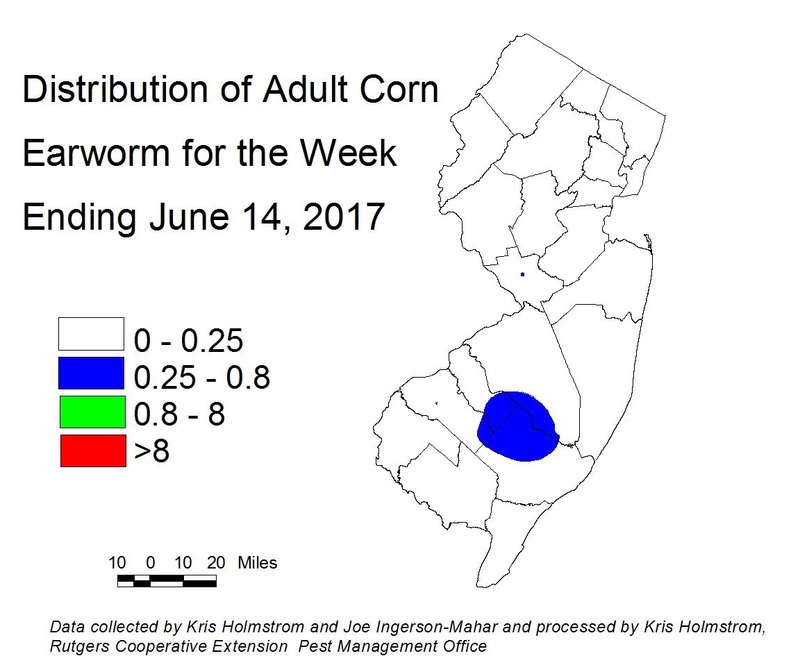 European corn borer (ECB) catches have stabilized, with significant catches remaining in central Morris County and in southern Hunterdon County (see ECB map). 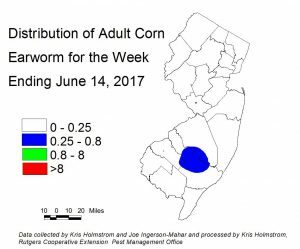 Feeding in NJ sweet corn plantings is increasing in occurrence, although severity of individual infestations has not risen dramatically. Overall, activity is lower than expected this year, likely due to adverse weather conditions. Feeding rates in the 20% range are common. Check 5 plants each in 10 random locations for a 50 plant sample. 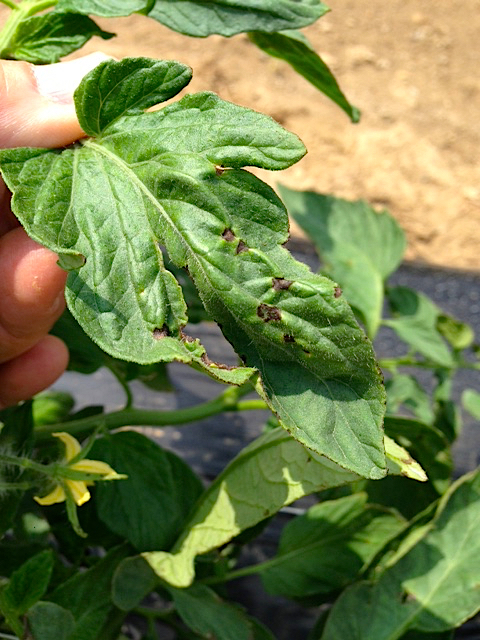 Look for “shot-hole” injury, and consider treating when the number of infested plants in a 50 plant sample exceeds 12%. As infested plants proceed to the pre-tassel stage, live larvae and damage may be found in the emerging tassels (see bottom photo at right). Once plants hit full tassel, ECB larvae will move downward on the stalk and re-enter the plant near the area where ears are forming. This can result in direct injury to the ear. Growers should consider an insecticide application at the full tassel stage to target ECB larvae as they migrate downward. This application can eliminate larvae that have escaped any earlier insecticide applications. Corn earworm (CEW) moths continue to be captured at low levels in blacklights over the past week. These individuals indicate that there is an ongoing, low population of this pest in active in NJ. In areas where sweet corn is silking, this is a moderate threat to the crop. At present, the highest activity is along the Atlantic-Camden County border (see CEW map at right), although catches have occurred broadly from Ocean County west through Mercer County. Several more CEW pheromone traps have been established over the past week. This network is also indicating low level population activity in southern and central NJ. Technical difficulties with mapping software this week has made a visual image of this population impossible at this time. We hope to have this “bug” corrected by next week. Imported cabbageworm butterflies (ICW) are very active and heavy egg laying is ongoing. 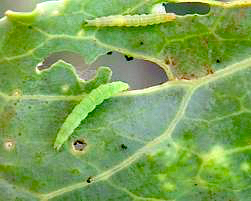 Infestations of this pest (see photo of caterpillar at far left) are becoming common, and can become quite damaging if not addressed quickly. Scout plantings weekly. Check 5 consecutive plants each in 10 random locations throughout the planting, paying particular attention to the innermost leaves where ICW often feed (see photo at near left). ICW may be controlled with many insecticides, including B.t. formulations such as Dipel (provided that small larvae are targeted). For a list of recommended materials see the 2016-17 Commercial Vegetable Production Recommendations. Diamondback moth larvae (DBM) are now the dominant pest species in plantings throughout the state (see photo below at right). 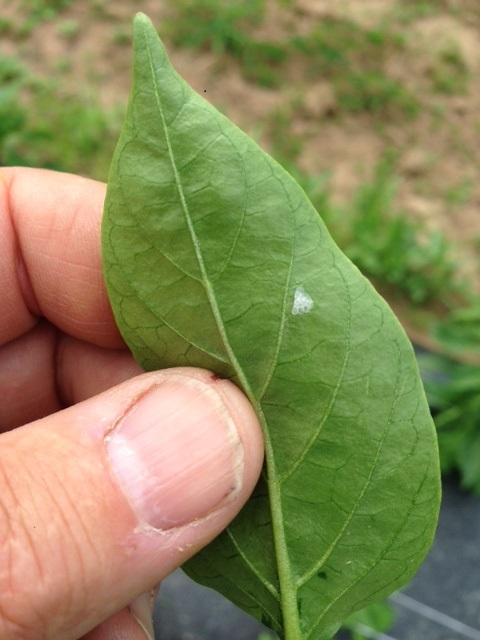 Bacterial leaf spot (BLS) has begun to appear in a number of tomato fields within the past 5 days. Avoid working in wet tomato fields if at all possible. 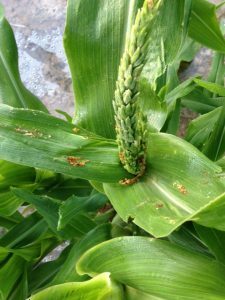 If bacterial infections are present in this crop, the pathogen may be spread by contact. 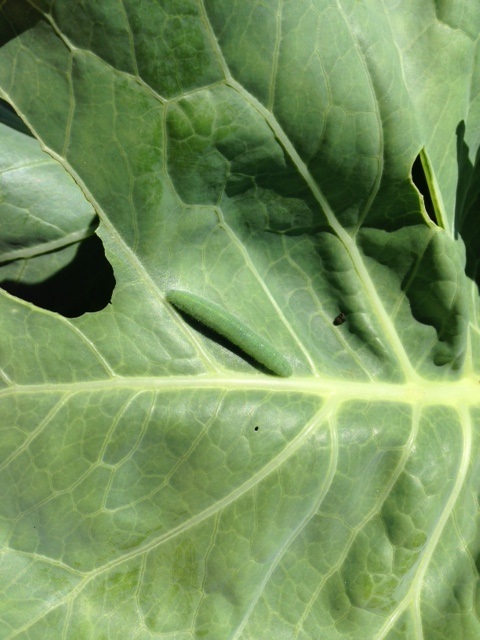 Bacterial lesions are frequently black in color (see photo at left), and are often present on the newest foliage, whereas early blight lesions and many symptoms of stress related nutritional deficiencies are often found on the older leaves. All tomato plantings should get the full anti-bacterial program found in the recommendations guide. This includes weekly fixed copper sprays (organic and non-organic systems) as well as the use of the immune response activator Actigard, and Quintec, a fungicide with some activity against bacterial pathogens. Along with BLS (see above), pepper plantings are now threatened by the ECB, as moths lay eggs on the underside of pepper leaves (see photo at left). 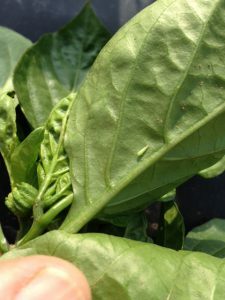 Larvae will hatch and bore into central stems of these small plants, causing the tops of the plants to die. While this is not terminal, it will prevent the production of crown fruit on affected plants. Scout 5 plants each in ten random locations. Check the underside of 2 leaves per plant. If 2 or more ECB eggmasses are found in this sample consider treating with a foliar insecticide or a soil applied insecticide such as Coragen. 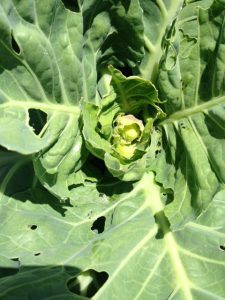 There are several options listed in the 2016-17 Commercial Vegetable Production Recommendations, including the OMRI approved spinosyn material, Entrust. Early planted pumpkins are now beginning to emerge. It is critical that these fields be scouted while plants are in the 0-4 true leaf stage. Striped cucumber beetle (see photo at left) is the most serious pest of these crops in this stage, not only because they cause direct injury to seed leaves and true leaves, but because at this stage, the beetles can transmit the bacteria that cause in bacterial wilt. Check 5 plants each in 10 random locations. If beetles are found actively feeding in 2 or more sites, consider an insecticide application to reduce the likelihood of bacterial wilt setting in later. Many pumpkin and winter squash seeds are purchased with a seed treatment that includes a neonicotinoid insecticide. 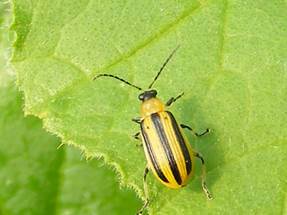 In this case, cucumber beetle feeding should be seriously limited for the first 2-3 weeks of growth. This is typically long enough to get the plants close to the stage where vines begin to run or bush out. 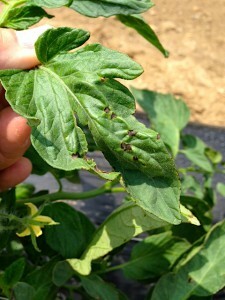 At this point, it is much more difficult for the plants to acquire a large enough bacterial load from the beetles to cause wilt. Organic growers of these crops should consider covering plants from emergence through just before vine run. This should limit beetle feeding and permit bee access to blossoms when the covers come off.